Yes, nothing wrong in being traditionalist! 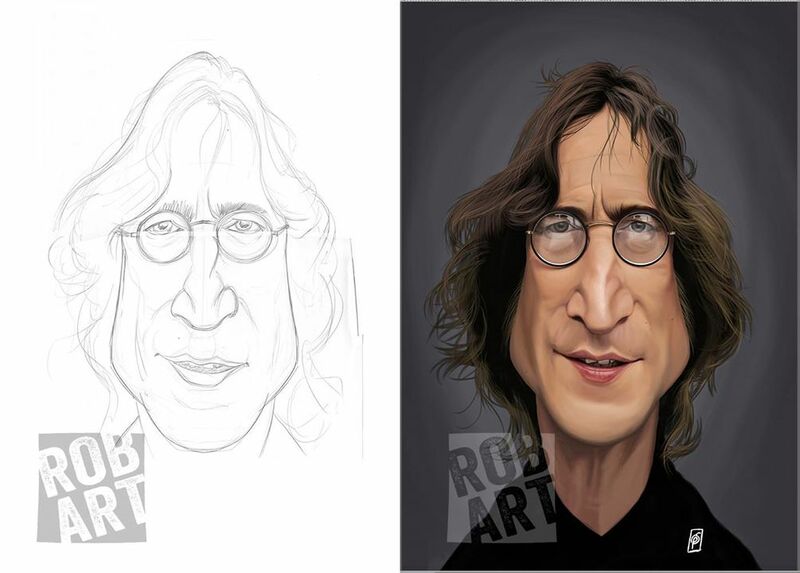 I’m not the best caricaturist out there, but I enjoy doing them. It satisfies my hunger to be creative, and at the same time tackles the challenge to test my abilities. Most of the time people get to see the end result; the finished image set ready to be posted on multiple sites. Very rarely do you get a chance to look at and study the first step in the process; the sketch. 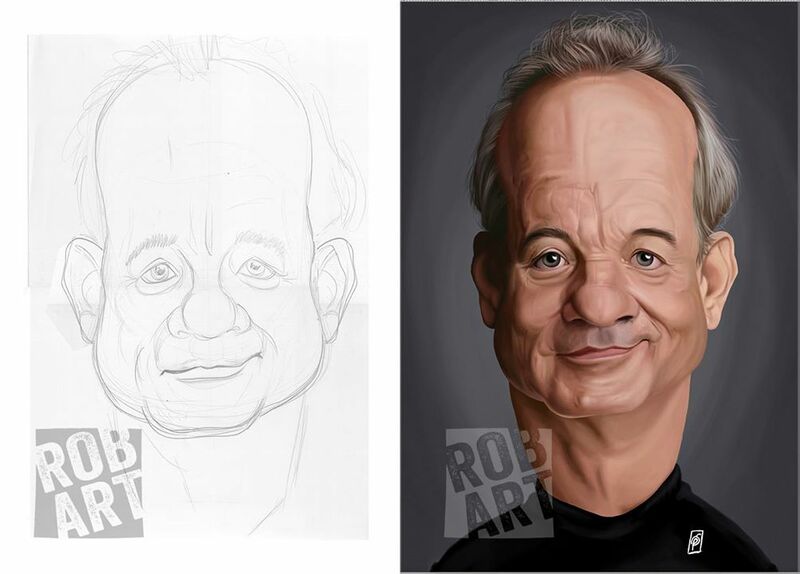 I thought I would do a post to show the differences in the final and the sketch stages of my work. The process tends to start around Friday midday, when I have to seriously think who I want to draw on the upcoming Sunday. After that I have to search the web for multiple images of the personality, to see the characteristic elements that maintain in all the images. I then choose one to base the pose on. As I said in my previous post, I have set the task of posing the caricatures in the front looking position, in all cases. So from that point I do the one thing I really like doing more than anything; taking up the pencil. I even explained to some of my students once, that the pencil has this raw smell of sexiness in a creative sense. Maybe it’s the beautiful smell of the pine, or the tactile touch, I don’t really know. But I do love working in pencil Anyway, even though these will all end up digital, I still take a piece of paper during the Saturday day off, and rough out a facial likeness. Sometimes it goes very well, and sometimes it doesn’t. I remember in the early days it took me 3 days to get the Woody Allen image correct. Now it goes a little better. Even though, at some point, I put the pencil down it doesn’t mean that I am satisfies with the promise of a good image from the sketch. If you look closely at some of the provided images here and compare, you will see that there are some changes made the the face shape, etc. 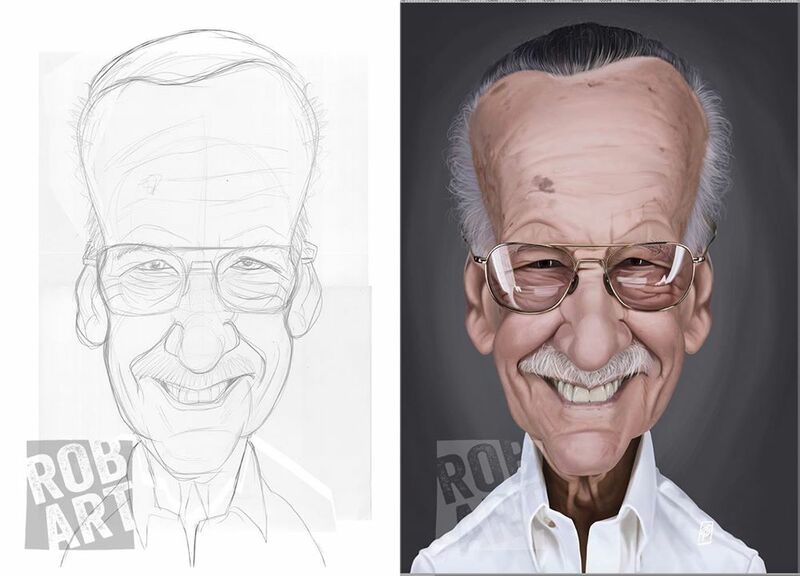 Stan Lee has a more raised cheek bone structure, for example. Nonetheless, I scan them in, and look at the in Photoshop, next to the reference. Minor changes can then take place digitally. I tend to use the ‘warp’ tool to make more exaggerations and even reflect things like ears and eyes if one looks better than the other. The big test comes when I start to do the painting. Many a time I take a deep breath and realise that the pencil has more control and flexibility at the end of the day, but the image needs to be painted. I also then remember that Photoshop has a pretty good history panel now. What you may be asking yourselves is why do I use the pencil at all. Well, the simple fact is that when I started drawing, some 46 years ago, there were no computers, like the wonderful Macintosh. It was a form of traditionalist training. All my illustrations back then were started and finished by hand. It was a long process, but it crafted a skill that I am happy to have. 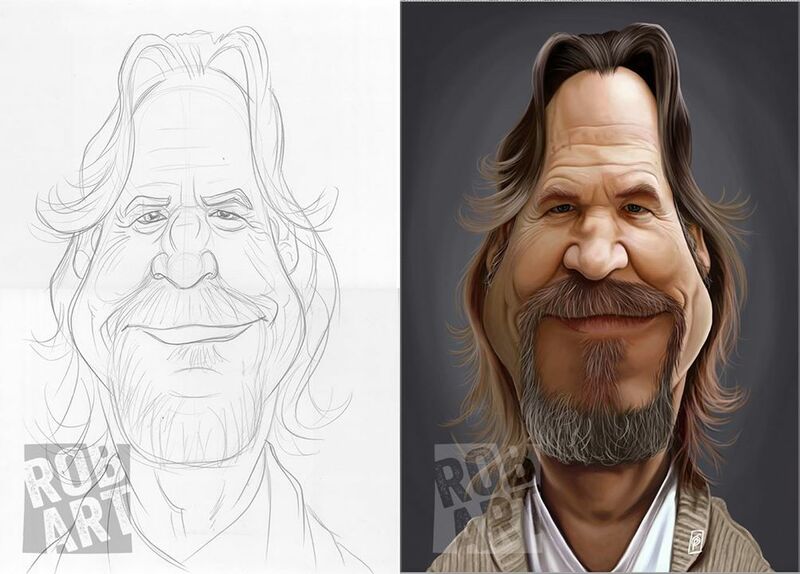 The sketch of Jeff Bridges is one of my favourites. Only done 3 weeks back from this post, it shows how things should look if everything goes well. 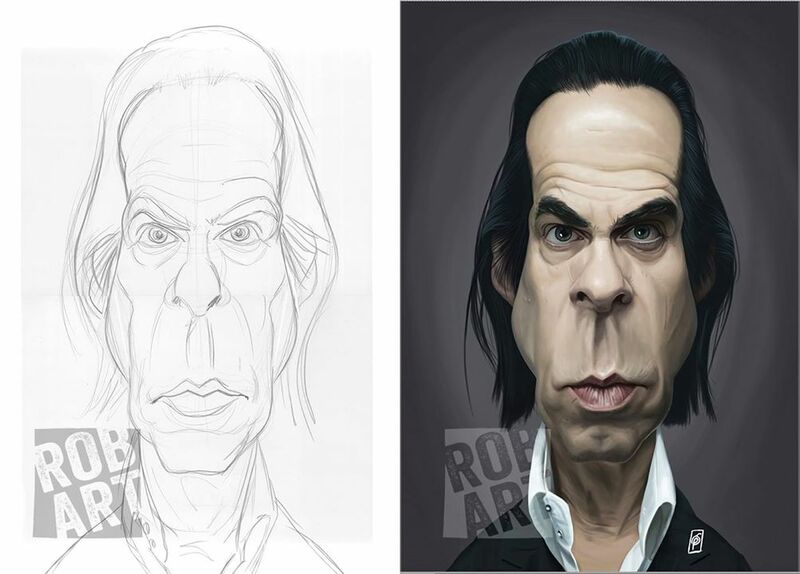 Even though there are final changes to the sketch, like his mouth is raise and centred, the overall feel is great. I like the rough line quality that gives it a freshness and open feel that allows the painting to be a little freer. Some, like the John Lennon one above was a little tiring to get right, and even then you can see I changed the shape of his face considerably when painting. For the time being I have some plans to complete the two running series; Vintage and Season Two, then I am thinking of looking into sport personalities, which I realised I have not even tried once. 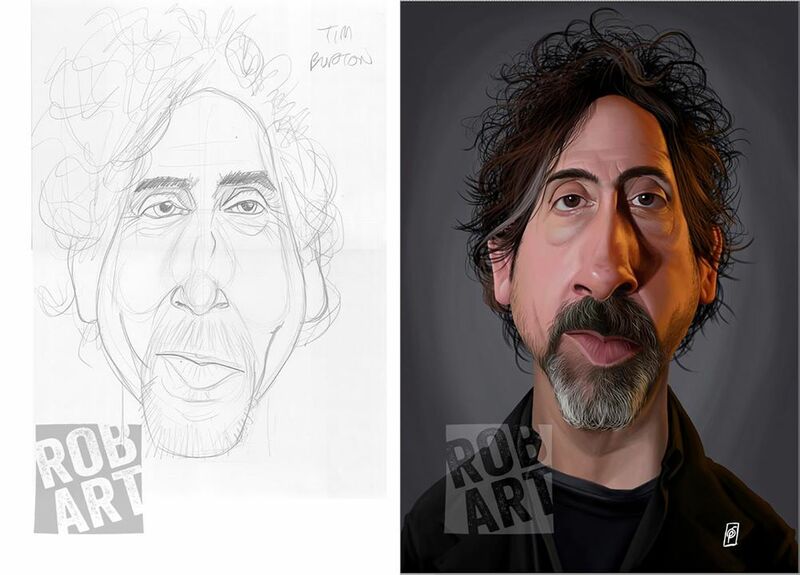 I am hoping that the current set of caricatures are liked and appreciated. Please add comments to the post if there is anyone you’d like me to consider.